alarmed at the large quantity of squid called for in the recipe below: once they hit the pan, the squid lose so much moisture that they shrink considerably. 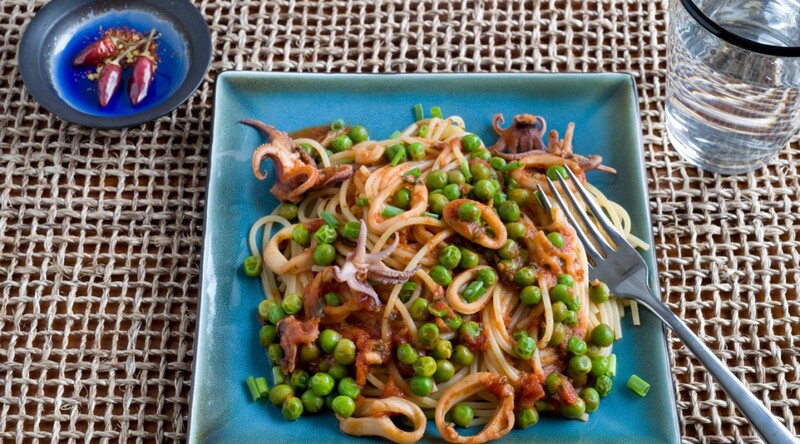 Ingredient notes: In Grado and other towns along the coast, cooks use cuttlefish for this recipe as often as squid; feel free to use cuttlefish if you find some at your local fish market. But remember: the smaller the squid (or cuttlefish), the sweeter the taste and the more tender the flesh. Warm the olive oil with the garlic and parsley over a medium flame in a deep, wide saucepan large enough to accommodate the pasta later. 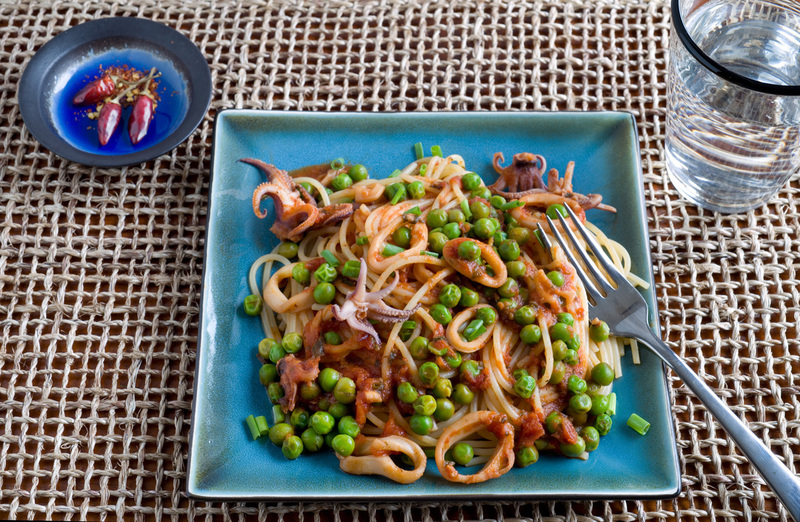 When the garlic is just fragrant, but before it takes on any color, add the squid. Cook 10 minutes, stirring often. Add the wine and cook until the wine nearly evaporates, about 2 minutes, then stir in the tomatoes, season with the salt and pepper, and cover. Cook over medium-low heat for 20 minutes, adding water as needed to maintain about ½ cup of liquid in the pan at all times. Stir in the peas and, if needed, some water to keep the sauce nice and moist. Cover again and cook 5 minutes. Adjust the seasoning and keep warm. Make the pasta: Bring 5 quarts of water to a boil. Add the salt and the pasta. Cook until al dente, then drain, reserving 2 cups of the pasta cooking water. Transfer the drained pasta to the saucepan and sauté 1 minute over high heat to meld the flavors. Add some of the reserved pasta cooking water as needed to thin out the sauce; it should coat the pasta nicely. Stir in the olive oil. Adjust the seasoning and serve hot, sprinkled with the chives. There are countless variations on this pasta: some call for a bit of tomato to be added instead of saffron; others suggest warming the pasta in the oven after layering it with the sauce; still others call for a dusting of toasted bread crumbs flavored with anchovies. The recipe below includes saffron, pine nuts, wild fennel, and raisins, and the flavor balance is just slightly sweet. This is a sauce that requires a bit of time and patience, but it is one of the pinnacles of Sicilian cuisine and deserves every bit of its fame. Ingredient notes: Wild fennel can be very hard to find; in Sicily it grows wild, but you may have to substitute the tops and fronds of fennel bulbs. I like to add a bit of ground fennel seeds along with the fennel fronds to better mimic the wild fennel flavor. Make the sauce: Soak the raisins in cool water to cover for 15 minutes; drain and blot dry. Rinse the sardines. Remove the heads, open them like a book, and remove the innards and bones. Rinse again and blot dry. If possible, try to keep the two filets attached. Select half of the sardines and set aside; these should be the best-looking ones, as they will be fried whole and placed atop the dish when serving. Bring 5 quarts of water to a boil. Add the wild fennel and cook 2 minutes, or until soft. Drain, reserving the wild fennel cooking water to cook the pasta later. In a deep saucepan large enough to accommodate both the sardines and the pasta later, heat ¼ cup of olive oil until shimmering over medium-high heat. Dredge the sardines you set aside in the flour, shaking off the excess, and fry until they are golden on both sides and cooked through, about 3 minutes total. Blot dry on paper towels. Season with ¼ teaspoon of the salt and set aside. Clean the saucepan and dry it. Place the remaining 2 tablespoons of olive oil in the clean saucepan. Add the onion and ground fennel seeds, and sauté over a medium flame until the onion is translucent, about 5 minutes. Add the less perfect sardines and cook, stirring and breaking them up with a spoon, about 3 minutes. Add the anchovies and cook until they melt into the sauce, about 2 minutes. 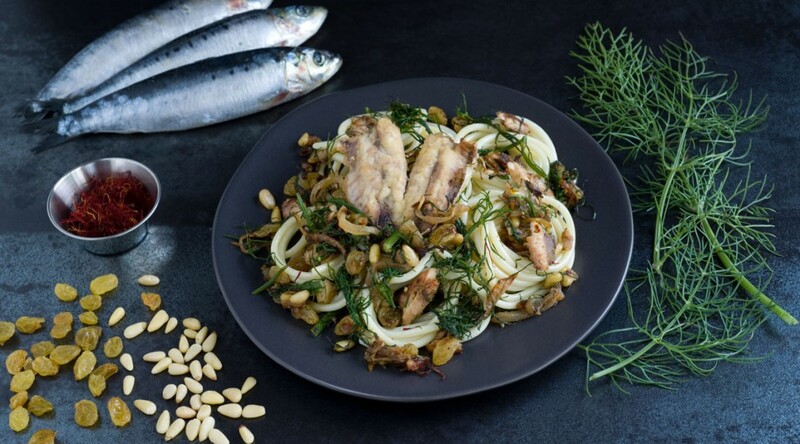 Stir in the drained and boiled wild fennel, the saffron, drained raisins, and pine nuts, and season with the remaining 1 teaspoon of salt and the pepper. Cover and cook 2 minutes; adjust the seasoning and keep warm on a very low heat. Make the pasta: Return the wild fennel cooking water to a boil. Add the salt and the pasta and cook until al dente. Drain, reserving 2 cups of the cooking water. Stir the pasta into the sauce and sauté 1 minute to meld the flavors. Adjust the seasoning as needed and dilute if necessary with some of the reserved cooking water. 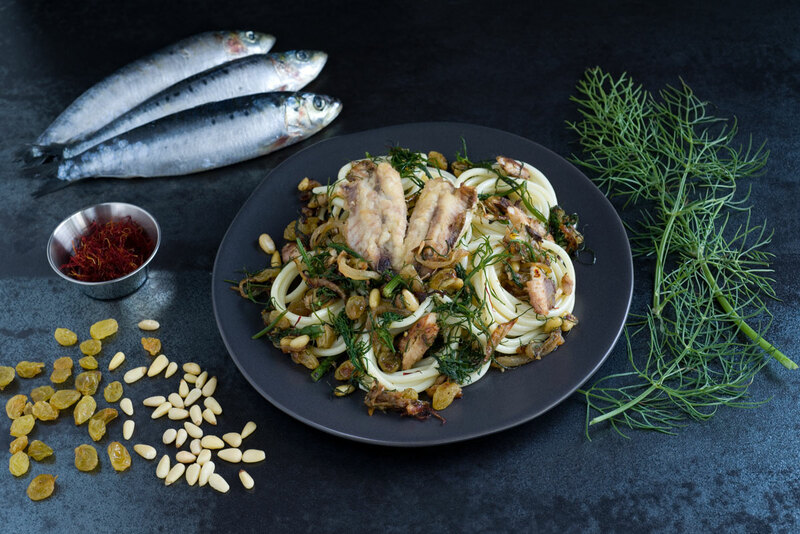 Serve hot, topped with the fried sardines.